Cuisine: Continental, Indian, Rajasthani and Mughlai. Traditional Rajasthani hospitality comes at its best while you stay at Rang Mahal on your tour to Jaisalmer, one of the famous historical cities of Rajasthan famous for keeping its age-old culture, history and tradition preserved and intact. Located in the heart of Jaisalmer, the desert city of India, the Rang Mahal is one place where travelers meets all their demand to relish the rich traditional Indian hospitality. The total 53 rooms of the hotel include 25 deluxe rooms, 25 standard rooms and 3 deluxe suites. 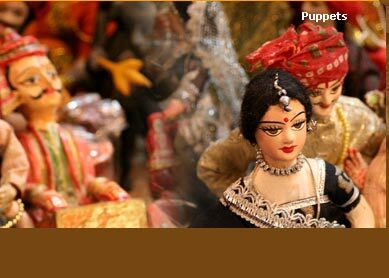 All the rooms are spacious and well decorated with beautiful curtains, antiques and paintings. Every rooms are equipped with attached bath, colour TV and direct dial telephone. Other facilities like swimming pool, laundry service, room service doctor-on-call, Internet, credit card acceptance, money exchange, safe deposit, travel assistance and banqueting & conferencing facilities are meant to keep guests at utmost comfort. 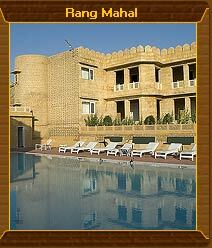 The restaurant of the hotel serves cuisine including Continental, Indian, Rajasthani and Mughlai. The best dining experience one can enjoy while availing the theme dinner by the pool side garden. 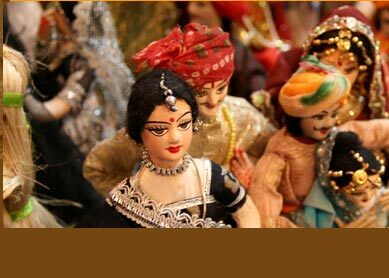 To add great taste to ones dinner, the hotel organises traditional Rajasthani folk music and dance. Bar of the restaurant has fine collection of domestic and international brand of liquor. Rush to very well managed swimming pool or walk to the zym of the hotel, you will get good way to spend your leisure while being at the hotel. To arrange outdoor visit, you can ask the hotel officials. The best they can can arrange for you will be camel safari ride. Camel ride taking you to golden sand world of Thar Desert will let you see an array of old havelis and temples of Jaisalmer. Famous places like Desert National Park, Jaisalmer Fort, Jain Temples, Nathmalji Ki Haveli and Gharisar are few to name you can explore while being at Rang Mahal.